Quite a lot actually. The one on the left was bought on ebay for £3.50 and came with no packaging or information. The one on the right was bought from Amazon for £11.20 and came with Nintendo packaging and a warranty. Read on for details of all the differences I discovered. The wiring of the knock-off defied logic with the red wire being used for the I2C SDA signal rather than supply voltage (which is a worldwide convention). This causes a lot of confusion as all the Wii Nunchuk wiring information you will find on the Internet describes how the genuine item is wired. The knock-off used blue for 3.3V, brown for ground, red for SDA and yellow for SCL. The only consistency with a genuine item is yellow for SCL. All the other wires are different. 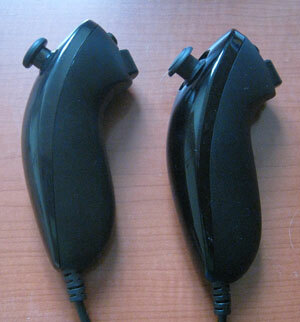 Another important difference is that the genuine version uses shielded cable but the knock-off does not. That’s not great if you are using your Nunchuk in an environment with lots of EMI. If the knock-off Nunchuk was slowly moved in any direction then all three accelerometer values would freeze until either the Nunchuk was jerked or it had been moved more than 30 degrees from when it froze. This is a total disaster for the application I need the Nunchuk for. The knock-off Nunchuk would reach the maximum and minimum values for the joystick when the joystick was half way between the center and the edge. The genuine Nunchuk uses the full range of motion. Another issue was that the knock-off version would not return data when the I2C clock was at 400kHz regardless of delays inserted. Dropping to 100kHz fixed the issue. Intermediate frequencies were not tested. The genuine version works fine at 400kHz. The knock-off version stopped functioning properly after about two hours of use. When power is applied it sends zeros for all data for a few seconds before switching to sending FFH instead. Note that I was supplying 3.3V to the Nunchuk before anyone suggests that 5V is bad. I think many of the issues come down to the accelerometer used. Perhaps I bought a defective unit, but my advice is to save yourself some time and hassle and get a genuine Nunchuk for your project. I’m sure some knock-off versions work fine – the problem is how can you tell which are OK? Print article This entry was posted by Andy on August 29, 2011 at 1:46 pm, and is filed under Software Engineering. Follow any responses to this post through RSS 2.0. You can leave a response or trackback from your own site.